While leisurely reading other blogs leading me to USA today articles on coaching changes, I came across this gem. I did not remember that USM actually sold a home game to raise the required funds to fire Ellis Johnson. That is just unbelievable. I like USM and support them in most things they do. My original plan for college included USM because they had a major that MSU didn’t. I finally decided that I wouldn’t feel right not going to MSU and a degree from the College of Business was just going to have to do. One thing that SEC fans, regardless of school, take for granted is the unbelievable booster support they receive. If a seat gets hot we usually talk about the big buyouts like they are an issue but in reality they aren’t. When the big boosters want a change, they get change. I was shocked at first by the lengths USM went to fire Johnson. I then wondered again why their fanbase doesn’t give back like others do. It’s an interesting situation that doesn’t make sense and probably never will. The link to the USA today article outlines many other costly firings in CFB. For as short as Embree’s tenure was, Ellis Johnson got even less time at Southern Mississippi after going 0-12 in his first season. Faced with growing fan unrest, interim president Aubrey Lucas and Southern Miss’ administration confronted a dilemma: find a considerable sum to fire Johnson or potentially lose more money if he couldn’t turn the program around. In response to a fan’s request to terminate the first-year coach and his staff, Lucas wrote, “To do as you recommended, I will need to raise $3million. Can you help? This is not intended to be a ‘smarty’ reply, but a sincere request for assistance.” The fan offered $1,000 and vowed to reach out to his family for help. Many other fans wrote saying they were willing to give from $100 to $1,000. But in the week leading up to Johnson’s firing, Southern Miss sold a home game vs. Nebraska for more than $2.1 million, according to letters between the schools’ ADs obtained by Deadspin. A longtime assistant, Johnson took over in 2012 after Larry Fedora parlayed a 12-2 record into a job at North Carolina. But Southern Miss followed the best season in school history with its worst, ending a run of 18 consecutive winning seasons. Richard Johnston, president of the USM Athletic Foundation, wrote to say that he was part of the mistake as a member of the search committee that chose Johnson. “I thought we made a good hire, even though he was our second choice,” Johnston wrote. “We need to cut our losses and salvage our supporters by showing them we acknowledged making a mistake and will, with their help, begin to rebuild this historical successful program.” He pledged $50,000 to help with the buyout. 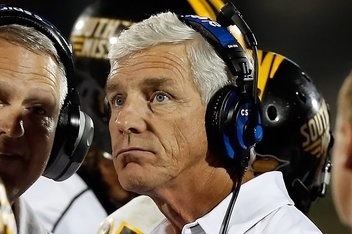 One fan summed up Southern Miss’ situation — as well as that of the other schools that fired coaches — better than others. “Whatever the cost now, it will be so much more if he’s allowed to coach another season,” he wrote. Today is the day of the NFL draft and many dreams will be made. One of my favorite happenings are the guys who kill the combine and their stock skyrockets. The workout warriors if you will. These guys showed freakish athleticism that teams drooled over and they used their top picks to acquire them. Many of these guys never live up to the hype and are labeled as a “bust”. Here are the top 10 NFL draft bust brought to you by The Lost Letterman http://www.yardbarker.com/author/article_external/13455118?no_yb=true&mailing_id=2341&linksrc=mb_main_col_8 . Great work by him as usual. How a college player performs in workouts after their college career often has just as much (if not more) bearing on their draft stock as their college careers themselves. Yet Brian Urlacher or Chris Johnson, many other “workout wonders” have failed to deliver in the NFL. We rank the NFL Draft’s Top 10 Workout Warrior Busts. Archuleta’s size (5-foot-11 and 215 pounds) raised doubts about his draft stock. He rendered those concerns moot by running a 4.42 40-yard dash, posting a 39-inch vertical leap and benching 225 pounds 31 times (staggeringly high for a DB). Archuleta was actually solid in five seasons with the Rams after they drafted him 21st overall. The dreaded b-word only became attached to him after he failed to live up to the six-year, $30 million contract the Redskins handed him following the 2005 season. Benched in D.C. and then traded, Yahoo’s Jason Cole recently ranked Archuleta the 10th-worst free agent signing ever. In defense of Heyward-Bey, he was likely just as shocked as everyone else when Oakland (now infamously) took him seventh overall four years ago. Although the Maryland WR wasn’t a bad player by any means — he had 138 receptions and 13 TDs in three seasons with the Terps — most pundits predicted that Texas Tech’s Michael Crabtree and Missouri’s Jeremy Maclin would be off the board before DHB. At this point, the late Al Davis’ infatuation with speed (Heyward-Bey ran the fastest 40-yard dash [4.25 seconds] at that year’s combine) is largely to blame for this epitome of a reach pick. DHB managed just 11 TDs in his four seasons with Oakland before being released this past March. The Colts inked him to a one-year deal on April 1st and are hoping for better results. If the phrase “workout wonder” ever finds its way into an actual dictionary, they might as well put Mamula’s picture next to it. The former All-Big East defensive end from Boston College was one of the first players to train specifically for the drills at the NFL combine and it showed with his eye-popping performance: A 4.58 40-yard dash, 28 reps on the 225-pound bench press, a 38.5-inch vertical leap and 10-feet, 5-inches on the broad jump. For “good measure,” he also scored a 49 out of 50 on the Wonderlic — the second-highest score ever recorded by an NFL player. So what did the Philadelphia Eagles get out of Mamula after investing the eighth overall pick in him? Six seasons and a disappointing 31.5 sacks. By 2000, at the age of 27, he was already out of the league. After spending four years as Arkansas’ starting quarterback, Jones had scores of draft pundits — among them ESPN’s Chris Mortensen — gushing about the physical potential he possessed as a converted receiver/H-back. It’s easy to see why Jones was referred to as “The Freak.” The 6-foot-6, 242-pounder turned in a gaudy combine performance: 4.37 seconds in the 40-yard dash, a 39.5-inch vertical leap and a 10-foot, 9-inch broad jump. Jacksonville surprised many by drafting him 21st overall, only to watch Jones start just 15 games over the next four seasons. He never caught over 65 balls or had over 800 yards receiving in any one season. What was really Jones’ undoing with the Jaguars was his pair of substance abuse-related arrests, which led to his release in March 2009. He is now out of the league. Rogers inspired comparisons to Randy Moss both in high school (he was Tom Lemming’s top recruit in the Class of 2000) and at Michigan State, where he won the 2002 Biletnikoff Award as the nation’s top wideout and set a still-standing school record for career TD receptions (27). Those comparisons only gained more credence after Rogers ran a 4.28 40-yard dash at the combine — a blisteringly fast time for a receiver as big as he was (6-foot-3 and 220 pounds). To the Detroit Lions, it was a no-brainer to select the Saginaw, MI, native second overall. Yes, injuries were a huge part of Rogers’ career, which he couldn’t control. But his off-the-field issues and a 36-catch NFL career is too much not to consider him a huge bust. There was a lot that made “The Boz” one of the most memorable players of the 1980s: His hatred of the NCAA, gaudy blonde Mohawk and undying love of the spotlight. And he could play; the 6-foot-3, 240-pound linebacker was a two-time First Team All-American at Oklahoma. In preparation for the 1987 supplemental draft, Bosworth backed up those on-field credentials by running a 4.6 40-yard dash and bench-pressing 450 pounds. In retrospect, unfortunately, the only substance to that style might have been the anabolic steroids that Bosworth tested positive for prior to the ’87 Orange Bowl. After selecting Bosworth in the first round of the ’87 supplemental draft, the Seahawks signed him to a 10-year, $11 million contract — then the biggest one in history given to a rookie — only for Bosworth’s most memorable NFL moment to be getting trucked by Bo Jackson. Bosworth retired after just three years due to injury. A one-year wonder at Oregon who threw for 3,763 yards and 30 TDs in his 1998 senior season, Smith had the size (6-foot-3 and 227 pounds), speed (4.66 seconds in the 40), smarts (a 37 on the Wonderlic test), arm and athleticism (he had played two years of minor league baseball) that made scouts drool. Smith flew up draft boards and was selected No. 3 overall, one spot behind Donovan McNabb. Alas, a long holdout impaired his efforts to grasp Cincy’s playbook fully. It didn’t help that Smith spent far too much time partying in the Queen City. He started just 17 games over four seasons with the Bengals — throwing five TDs and 13 INTs — before they released him in 2002. Before he was “The Incredible Bust,” steroid-fueled Tony Mandarich of Michigan State was “The Incredible Bulk” — a player who Sports Illustrated proclaimed to be “the best offensive line prospect ever.” His workout numbers are still the stuff of legend: 39 repetitions on the 225-pound bench press and a mind-boggling 4.69 seconds in the 40-yard dash. Taken second overall in the 1989 draft by the Packers, Mandarich was done in Green Bay after three years spent mostly in the throes of painkiller and alcohol addiction. While he enjoyed a nice three-year comeback with the Colts (1996–1998), it’s not enough to prevent him from being one of the biggest busts in NFL history. Making this selection even more painful for Packer fans, a running named Barry Sanders was taken one pick later by the Detroit Lions. After all, Gholston was a stud at Ohio State, registering 30.5 tackles for loss and 21.5 sacks in three seasons with the Buckeyes. And he was even more of a stud at the combine, running a 4.58 40-yard dash (blazing for a 6-foot-3, 260-pound defensive end), doing 37 reps on the 225-pound bench press and recording a 41-inch vertical leap. Jets fans at Radio City Music Hall were overjoyed when their team supposedly got something right, taking Gholston sixth overall. They were decidedly less pleased after Gholston recorded zero sacks in three lackluster seasons with them. Gholston hasn’t played a down since. It’s easy to forget now, but Russell was considered a freak of nature prior to being selected No. 1 overall in the 2007 draft. NFL network analyst Mike Mayock called Russell’s pre-draft workout “the best pro day I’ve ever seen in my life.” Weighing in at 256 pounds and running the 40 in an impressive 4.8 seconds, the 6-foot-6 Russell showed off a cannon arm with which he could reportedly throw the ball 65 yards from one knee. Of course, none of that mattered when Russell got to the league out-of-shape and looking completely lost in the pocket. In three seasons with the Raiders, Russell had more interceptions (23) than touchdowns (18) before getting the boot. Russell is widely considered the co-biggest NFL draft bust ever alongside Ryan Leaf. Now mounting a football comeback, don’t hold your breath for an NFL team to give Russell another chance. 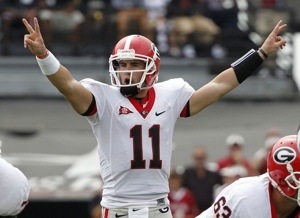 What SEC East Players Do You Fear? As I did on the 23rd, I will go through all the SEC East teams and pick a player from every team. The premise is to pick a player that strikes fear into your heart. The player that your coordinators will loses sleep trying to come up with a scheme to slow them. Make no mistake that to beat these teams, you must slow these guys. South Carolina Jadeaveon Clowney- The junior DE is a freak of nature. Whether it’s blowing up Michigan running backs (http://www.sbnation.com/college-football/2013/1/1/3825442/jadeveon-clowney-dot-gif ) or just generally striking fear into offensive players, Clowney makes USC go. He terrorized offenses last year racking up 23.5 TFL and 13 sacks on his way to being the most celebrated defensive player in the SEC (Should have been the country but don’t get me started on the Teo fraud). I think Clowney has a legitimate chance at making a Heisman run from the DE position. Georgia Aaron Murray- The senior QB raised some eyebrows when he decided to return for his senior year with many thinking he was NFL bound. Over his career he has thrown for 10,091 yards and 95 TD’s. Not only that, he’s done it in the best conference in America. Murray is battle tested and knows what it takes to get the job done. He finished just a few yards short of what would have ended up being a national championship when they fell to Bama in the SEC title game. Make that 2 Heisman contenders in the East. Florida Loucheiz Purifoy- With the loss of Matt Elam, the Gators have a new playmaker to lead the secondary and Purifoy did it all last year. He was 4th on the team in tackles getting 51 from his CB position. The Jr also filled up the stat sheet with 5 PBU, 3 FF, and 2 blocked kicks. In short, Purifoy makes big plays again and again and I expect it to go to the next level this year. 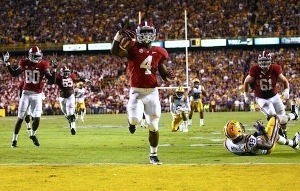 Look out for him getting 1rst team All-SEC looks and making it on Sports Center’s top plays. Vanderbilt Brian Kimbrow- Some may call this a surprise pick but I don’t think you’ll be surprised by seasons end. Last year he was behind star Zack Stacey and still got 66 carries for 413 yards and 3 TD’s. For those counting, that’s a 6.26 average per carry. Vandy will have a new QB and I look for them to lean on the sophomore RB’s elite speed and playmaking ability, particularly early in the schedule. He only had 3 catches last year and I expect that to be much more utilized next year. All Kimbrow needs is a crease and he can take it in for 6. This is one of the guys I’ll be telling you “I told you so” after a few games. Tennessee AJ Johnson- The junior LB was an absolute tackling machine last year getting 138 total stops and 8.5 TFL. With Butch Jones having to replace a ton of guys on offense it makes it easy to look defense and you can’t look past Johnson. He also registered 1 sack and 8 QB hurries. After another year of training and his teammates around him expecting to perform better, I expect even more from AJ. I wouldn’t be surprised one bit to see him grab some All-SEC honors at seasons end. Kentucky Demarco Robinson- This pick is based on a lot of potential and my expectations of what a Stoops offense will bring to the Wildcats. Robinson isn’t the biggest guy at 5’10 160 but he is an outstanding playmaker. Last year he was 2nd on the team with 28 catches with what could be described as a lethargic offense. Stoops will throw much more and utilize his speed guys and playmakers and I expect Robinson to be the main guy to benefit. Missouri James Franklin- Last year was a down year for the rising senior QB. We saw a significant production decrease from the year before. On his career he has 4,533 yards through the air and 32 Td’s. I’m counting on a rebound year for Franklin. Old OC Daivd Yost is gone so look for new wrinkles and ways to use his talent more efficiently. Last year was a rough year for Missouri as a whole and not just Franklin in their 1rst in the SEC but I expect a much better year out of them led by the James Franklin of 2011 where he threw for 2,872 yards and 21 Td’s and was a dynamic playmaker.